Where can I buy DYNAFIT products? An overview of all DYNAFIT retailers can be found here. Of course, you can also buy direct in the Dynafit Online Shop from the comfort of your couch. Take a look here at our entire collection, equipment and accessories. Does DYNAFIT also sell its products direct to consumers? Yes. In our Online Shop, you can find all of our products that are currently in inventory. Why should I buy directly from DYNAFIT? We are a full-line brand, winter and summer. When shopping with us,you can pick out your coordinating outfit however you like and get moving. For warranty issues, you can then turn directly to the manufacturer. As a DYNAFIT member, you enjoy additional benefits. Among other things, you can register your products online and receive an extra year of warranty as our gift to you. How can I sign up for the Dynafit Club? If you already have a customer account, then just click on the following link and enter your email and a password. If you do not have a customer account, then click here and set up a new account. Why should I setup a customer account? It saves time and offers you tantalizing advantages. You don’t have to enter your delivery or billing address every time. When you ship off an order, it will be automatically delivered to the address in your account, unless you enter another address. You can browse around in our Online Shop and then finalize your order at a later date. The products that are already in your shopping cart remain saved there. In addition, as a Dynafit Club member you get access to exclusive stories and offers. I have questions about a product I bought, who can help me? If you purchased the product at a retail shop, then please return to the shop where you bought the DYNAFIT products. If you purchased the product in the DYNAFIT Online Shop, then you can find all the contact information here. Wash gloves by hand in warm water (no softeners or bleach). To dry them, do not place them on a heater or in the sun. Best is to press out any water left after washing starting at the fingertips and squeezing down carefully to the wrist opening with the opening pointed down. Store gloves in low temperatures in a dry environment. Surface dirt can be cleaned off with lukewarm water and a brush. In treatment exterior surfaces, avoid products containing oils or greases since these can impair the breathabilithy of footwear. For sand, gravel and other dirt on the inside, just remove the footbed and shake out any dirt. How is the fit generally speaking of DYNAFIT clothing? Tight Fit -- Made of stretch fabrics, these products fit the body snugly and comfortably. With a close-fitting shape, this apparel offers optimum moisture management and effective insulation. Athletic Fit -- With an anatomically correct shape, this apparel offers complete freedom of motion desired for physical activity. A lower volume results in a minimal packsize and is thus suitable as a base layer on colder days. Sporty Fit -- With their anatomically correct shape and versatility, this clothing with a comfortable fit offers maximum freedom of movement and allows a wearer to comfortably combine several layers. Dynamic Move -- With its exacting two-way stretch inserts (moves with you in both lengthwise and crosswise directions) and an ergonomic cut, you get apparel that stretches with your movements and also is optimized in design for wear with a backpack. Bodymapping -- With morphologic-based fabric choices for each activity that are mapped for personal body zones and movement, you get chafe-free fabric support, reduced muscle vibrations, and zone-specific breathability. What ski size do I need? Ski style + terrain If you like speed when you are out and about, then you need more of a longer ski and that will offer less chatter. A longer ski can even come in handy when skiing lines in deep pow. On narrow, steep slopes, however, preferably something shorter. Those who like short-radius turns will find their thrills in a somewhat shorter ski too. Rocker: In skis with rocker construction it can be generally said that they can gladly be a bit longer. The longer the rocker (tip/tail), the longer the ski you can select. Height + weight: Larger, heavier skiers as well as more advanced skiers usually prefer a longer ski since they apply more pressure to the ski and can therefore experience a benefit of smoother skiing with less chatter. Smaller, lighter people as well as less experienced skiers usually feel more comfortable with the maneuverability of a shorter ski. Which DYNAFIT binding is compatible with which DYNAFIT boot? Fundamentally, all DYNAFIT products can be used in combination with each other. On our website,you can find all products in each segment where we have categorized them. The setups are designed so as to support each activity in the best possible maner. Of course, you also create your own personalized setup and in doing so still enjoy the benefits of the compatibility of DYNAFIT gear. How can I adjust the TLT Superlite or the Low Tech Race Binding in length? For both bindings, there is an adjustment plate that can be mounted underneath the heel unit. The adjustment plate can be found either by ordering it in our Online Shop or at your favorite Dynafit retail shop. For mounting, it is best to head to your nearest Dynafit retailer. Locate your store here. Which boot liner is best suited for very cold conditions (expeditions)? Tips and tricks for cold feet include everything from handwarmers like Thermopads to neoprene socks or hot water bottles tucked into the sleeping bag. If nothing helps, then we recommend heated footbeds, which are available in various models and price levels. If you are preparing for an expedition, you also need to have an additional pair of bivouac booties along to also have warm feet at night. Where do i find user directions for my DYNAFIT gear? All user directions as well as product videos can be found here. Which running shoes will work for me? Which backpack is the right one for my activities? We also offer a large selection of backpacks, from volumes of 600 ml up to 35l. Here too you can find just the right pack for every activity in the respective segments on our website. If you need more information for your summer runs about choosing the right pack, you can read more detailed information here. I need help with my DYNAFIT product. How do I proceed? Where do I get replacement parts for my Dynafit gear? For replacement parts, it is best to return to the shop where you bought your DYNAFIT product. The retailer knows precisely how your replacement part needs to be expertly mounted/assembled. My DYNAFIT product needs repairs. What do I do? If you have problems with your DYNAFIT items, then please head back to the shop where you bought the product. Here is where you can find expert advice. If you however needs additional help, please contact our customer service: customercare@dynafit.com. We recommend that you send along one or more photos of the issue, too. That will make our job easier in identifying your issue and save you time. Where can I have my bindings and other products assembled/mounted? Please go to your specialty retailer for assembly/mounting of any kind. Specialty retailers have the expertise as well as the equipment to adjust your binding to your height and weight. The next closest DYNAFIT shop to you can be found here. Is my DYNAFIT equipment also compatible with other brands? In general, DYNAFIT equipment can be combined and used with other brands. Essential, however, is the question of compatibility regarding ski touring boots and bindings. In order to ensure your setup won’t let you down, please ask for advice in your favorite store to see if your setup is compatible and was properly adjusted. Which DYNAFIT touring boots are compatible with my frame bindings? 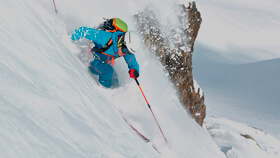 What fabrics does DYNAFIT use in its apparel? DYNAFIT uses various fabrics to achieve the best benefit suitable for each activity. To that end, we work with a variety of partners, including drirelease®, GORE-TEX®, PrimaLoft® and Polartec®. Characteristics such as performance, lightness and simplicity determine our selection process for the perfect materials and fabrics. Here you can find an overview of the fabrics and materials we most frequently use. How should I wash my DYNAFIT apparel? Pay particular attention to the temperature and care advise on the clothing tag. For detergent, we recommend mild detergent or detergent designed specifically for sports apparel. Please do not use any fabric softeners. Jackets and pants with either POWERTEX® or GORE-TEX® membranes can be washed without a problem in a machine at 30°C - 40°C. Fabrics such as Lycra or Elastane should only be put in a low spin cycle (no more than 500 revolutions). Down-filled textiles should be washed in a machine at 30°C, with a small amount of detergent and a low spin (max of 800 revolutions). Best to dry them in a dryer. If you do not have a dryer available, then hang them in a shady location and shake them out firmly two times a day to avoid clumps caused by dampness. Waterproof treatments do not last forever. As soon as water is not beading up anymore on the surface, we recommend you restore water repellency with a treatment. This guarantees continued breathability upon exposure to moisture. How should I do a waterproof treatment to my DYNAFIT apparel? It is time to restore waterproofness when you notice that the exterior isn’t so water repellent anymore, i.e. water doesn’t bead up. To start your treatment, first wash your apparel according to care instructions and then air dry it or dry it in the dryer on a gentle cycle. As soon as the item is dry, put it in the dryer for 20 minutes to reactivate the DWR waterproof treatment (Durable Water Repellency) that was applied during manufacturing. Instead of a dryer, you can also use an iron: To do this, turn it to a low temperature (warm, no steam) and put a hand towel between the apparel and the iron. After a certain period of time, the treatment applied during manufacturing cannot be reactivated anymore. In that case, it is recommended you apply a new DWR treatment from a specialty brand on the outer layer of your item. Here you'll find a tutorial. Can I change an order after placing it? After you have placed an order in the Dynafit Online Shop, you can unfortunately no longer change it. However, returns are always possible for any reason in 30 days or less. Click here. I am having problems placing an order. Where can I get help? If you are having difficulties placing an order, please contact our customer service team. customercare@dynafit.com or +49 8990993180. Which types of payments are accepted by Dynafit? Our payment methods can be found here. Information about your order status can be found in your account information, click here. For Tracking, click here. How long will it take for products I ordered to be delivered? All products will be shipped in 1-3 days after the order is received. The delivery times given are however related to the day a package is transferred to the delivery service. Since we work hard to process your order as fast as possible, we are unfortunately unable to change a shipping address after an order has been placed. If you have additional questions regarding this, please get in touch with us. Can I expedite the delivery process? At this time, standard shipping is the only option available. We do not offer express shipping at this time. We make an effort to process you order as quickly as possible so the product arrives in 1-3 days. A list of shipping costs for various countries can be found here. What countries does Dynafit deliver to? A list of the countries where we deliver is available here. As soon as a package is transferred to UPS, you will receive an email with a tracking link where you can follow the status of your shipment. We strive to deliver your order within our delivery window but sometimes there are unforeseen circumstances that delay a delivery. Here are a few reasons why a shipment can be delayed. You have ordered more than one product. In exceptional cases, your order could be delivered in separate packages and arrive at various times. There are unforeseen factors that are out of our control. I don’t like the product / it doesn’t fit right. For how long can I return my item and where do I get a return number? For new products that were purchased in the Dynafit Online Shop, the right to a return by law is 30 days. Every item send back to Dynafit must have a return number enclosed. You can get on by clicking on this link. It is unfortunately not possible to exchange a product you are returning with a new product. If you want to exchange an item, simply send it back as a return and place an order for the new product desired. How and when will I receive my refund? I was shipped the wrong product. What do I do now? If you placed your order via the Dynafit Online Shop and received the wrong product, please contact us directly here. We will help you with the return and refund process. How can I sign up for the Dynafit newsletter? So you want to always be up-to-date and never miss sales or events? Then just sign up here. How can I unsubscribe from the Dynafit newsletter? So you want to unsubscribe from the Dynafit newsletter but still keep your account? That’s really simple. In the lower part of the newsletter you will see a link that says “unsubscribe.” By clicking on this link you can really simply remove yourself from the distribution list. I have a promo code. How do I redeem it? With a promo code you will receive a discount on a purchase from our online shop. On the order summary page, just click on the promo code box to enter it. Enter your code in the box and then click “apply.” Please remember that a promo code is only valid for a limited time. It can also not be combined with other promotions, sales or discounts. How do I get the latest information about Dynafit products and offers? In order to receive the latest details about Dynafit products and offers, you can subscribe to our newsletter here. Are the prices different in the Online Shop from those at Dynafit retailers? The prices in our Dynafit Online shop are based on our official price list. Retailers can however offer other prices and discounts. Normally, however, these are not more than Dynafit’s recommended prices. What do I do if the answer to my question is not here? Will bindings come mounted to the skis? Skis and bindings are not delivered mounted; rather, they must be mounted and adjusted by a retailer.